With HDInsight, the Windows Azure platform provides a powerful Platform-as-a-Service (PaaS) offering for quickly spinning up and managing Hadoop clusters on top of Windows VMs. These clusters are based on the HortonWorks Data Platform (HDP) distribution. Currently, the newest version of HDP in HDInsight is 1.3.0, which is deployed with the HDInsight version 2.1 (go here for the Microsoft versioning story). For sure, HortonWorks will eventually release a 2.x version for HDInsight on Windows, but if you prefer Ubuntu or you need a Hadoop v2 cluster now – what to do …? Well, the good news is that Windows Azure is a very flexible platform and does not only provide platform services like HDInsight and many others, but also a powerful Infrastructure-as-a-Service (IaaS) model which allows you to deploy virtual machines based on Windows or Linux and manage them in virtual networks. So, Windows Azure IaaS allows you to build your own Apache Hadoop v2 cluster running in Ubuntu. In this post I will walk you through the steps to get there. We will build up a Hadoop 2.2.0 cluster consisting of a single master node and 2 slave nodes, using a custom-built VM image for all Hadoop nodes. Basically, the post will enable you to build arbitrary-sized Hadoop clusters on top of Windows Azure. I assume that you already have some practical knowledge about working with Windows Azure and know how to create networks, virtual machines, etc. I will reference the online documentation in order to keep the post compact. Of course you can pick different values and IP ranges but I recommend you stick with the ones above as I will refer to them throughout the post. Remark: You don’t need to configure a DNS server as long as you deploy less than a total of 50 VMs in the cluster. We will deploy all Ubuntu machines to the same cloud service which gives us Azure-provided name resolution. If you need more than 50 machines (which is the max. number of VMs per cloud service) you would have to deploy them to multiple cloud services and additionally deploy a DNS server in the virtual network or use the hosts file. Leave defaults for all other parameters. You might have to pick a different DNS name if the one above is already taken. In this case you will have to replace all URLs in this post by your own cloud service name. As soon as the VM is in ‘Running’ state connect via SSH (see here), using the hduser account you have specified above. Next, we will download Hadoop 2.2.0 for our environment. Other versions from the v2 branch should also work. You might want to select a different mirror for your download. Now, our Hadoop distribution is located in /usr/local/hadoop-2.2.0. Now, we need to set a couple of parameters in the Hadoop configuration files in the $HADOOP_HOME/etc/hadoop folder. Note, that master is the hostname of the master node in the cluster and tmp is a directory for temporary files, that you need to create in the home path of the hduser. Go ahead and create that directory now. Note, that the value for dfs.replication is the number of replicas you want to keep in your HDFS file system. As we will start with two slave nodes let’s set it to 2. The configuration defines the paths for the Hadoop namenode (dfs.namenode.name.dir) and the datanodes (dfs.datanode.name.dir) . Note, that you need to create those directories before starting the cluster. So, go ahead and create a hdfs directory in the hduser’s home dir and two subdirectories namenode and datanode. There might only be a mapred-site.xml.template file in the directory, so create a copy first and call it mapred-site.xml. 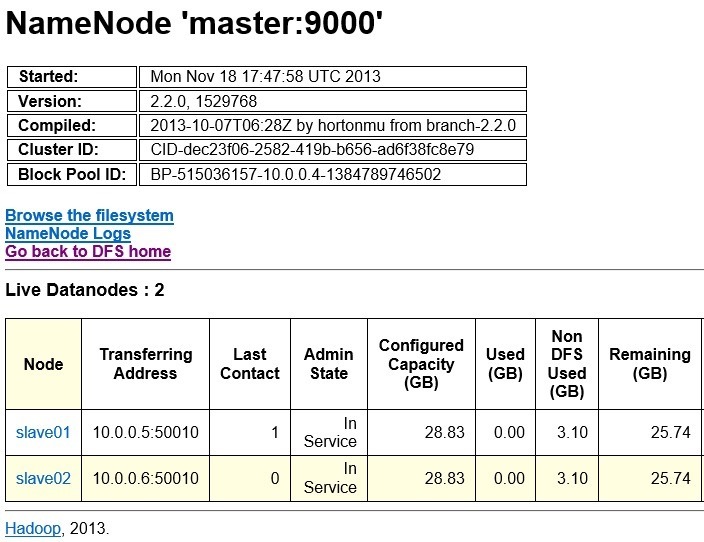 Note, that master is the hostname of the master node in the cluster. Note, that these entries depend on the order of VM deployment. The master node will be deployed as the first machine in the virtual network, which (at least today) means that it will get the first available IP address in that subnet, which is 10.0.0.4. In any case you will have to check later on if the master and the slaves got these IP addresses. If not you might have to change the hosts file. Also make sure to specify the correct hostname for the master and all slaves. Note, that we are creating the master from our custom image. Make sure to use the same account hduser that we used for the template as well. You might want to pick a different VM size, depending on what you are planning to use your cluster for. 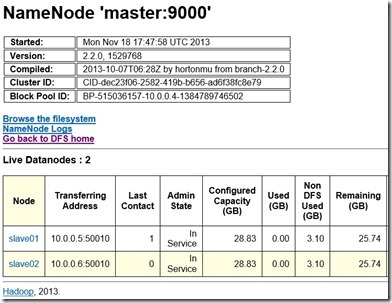 In HDInsight, the master node is deployed as a XL instance, the slave nodes as L instances. Create the three endpoints above as TCP endpoints, they will provide insight into the cluster from the browser later on. Do the same for the second slave using the Virtual Machine Name slave02. Make sure to remove the entry for localhost, as we don’t want the master to be a slave in our setup. ssh-keygen -t rsa -P ""
It will take you to a hduser@slave01:~$ prompt. Exit the session and repeat the last two commands for slave02. Now you’re good to go and build up much larger clusters based on a custom Hadoop image. Doing so in PowerShell will give you speed, agility and save you lots of money compared to the ‘classical’ approach, which is doing that in your own environment. For details about using PowerShell in Windows Azure go here. One more thing to note: the proper way to use HDFS with Ubuntu in Windows Azure would be to mount one or more data disks on each slave node and locate all HDFS data on those. I didn’t do it in this post in order to keep things simple. This article describes how to attach a data disk to a Linux VM. Have fun & let me know if the setup described above works for you. This entry was posted in Hadoop, Microsoft Azure and tagged Azure, Hadoop, HDInsight, IaaS, Microsoft Azure, Ubuntu. Why not use start-dfs.sh and start-yarn.sh? You’re perfectly right, that’s even simpler. I just wanted to make clear which single components will be started up. Thanks for pointing that out! One more thing that I found, It keeping looping the map reduce for like 1 hour. You might want to check the logs of the resource manager and node managers. Does the issue persist if you deploy the cluster to medium-sized VMs? Great article! it’s work perfectly. Thanks! A most excellent article, the instructions were clear and everything worked, thank you very much. Many thanks for that post. It was really helpful and works fine in my case. The only problem that I have is to communicate between the VM’s to run e.g. MPI processes on two or more VM’s. I have created a datadrive on the master and tried to mount it from slaves, but did’t work. Does anybody have a clue on how to do that. Many thanks in advanced.